Original CSF-3 Super Feeder serviceable for years to come, made in USA and sold by Super-Feed for over 23 years! All parts readily available and easy to replace if ever needed. Mount it your very own way to fit your application. Adjust it from very tiny to larger portions. 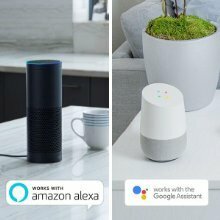 Some Wi-Fi/automation/voice command systems may also be used. See how Google example works for a customer if wanting to use voice activation. 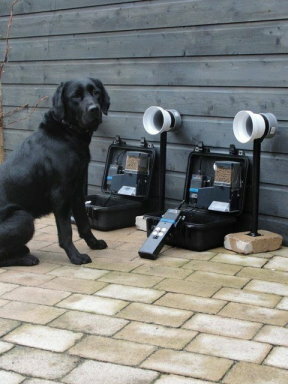 One feeder mounted to cat play stand and two feeders also shown to trigger at very same time with one timer. Although it will feed a cup or even more with multiple feeding cycles, if you need to feed your cat, rabbit or other small pets very small portions several times a day and don't want anything large, this basic package HOLDS 1 QUART AND 3/4 CUP (1.5 lb of food) and can be easily increased later using extra clear extensions or a 1.5 gallon hopper (24 cups capacity available separately). 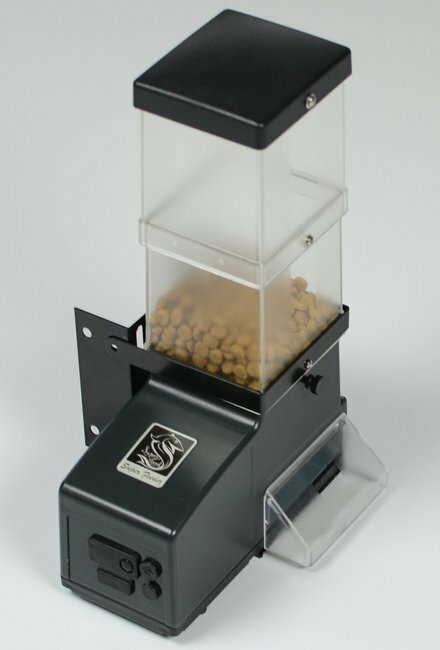 It will dispense dry or slightly moist kibbles/pellets extremely well, like the "Special Kitty" and "Happy Cat Moist" brands as an example. Voltage required: Power supply 110-240VAC 50-60Hz 12VDC output, USA style plugs only-not battery operated. If a 120V power source is not available, you may even use any of our 6-24V timers listed here to use your own low voltage power source (some wiring required). NOTE: MAKE SURE you have in your possession a lamp timer or other type device like a wi-fi system to "trigger" your Super Feeder at desired programmed times. This package does not come with external timer. You may also check "Feeder Combos" for complete set-ups including a timer or wi-wi plug of your choice to suit your needs. 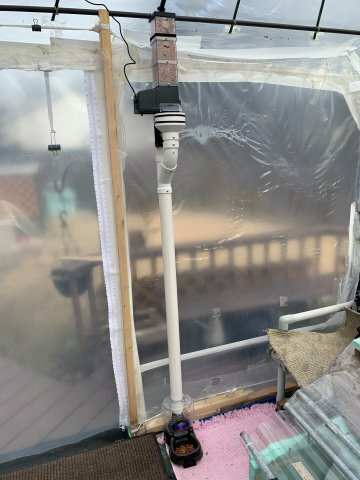 This "basic" feeder package comes with a black powder-coat metal bracket, strap, two 2 polycarbonate clear extensions (2-cup capacity each), a 12VDC power supply that you will plug into a timer, hardware and instructions manual. It does not include items to mount to like wood stand, etc..., only hardware. This package deal will require some simple mounting handyman works. IT MUST BE MOUNTED TO A 2X4 IN YOUR GARAGE OR PATIO, A PIPE, OR YOU CAN MAKE A SIMPLE WOOD MOUNT AND BASE. YOU MAY ALSO PURCHASE OUR READY-MOUNT AND PLATFORM LISTED BELOW FOR YOUR CONVENIENCE. THE "BASIC" MODEL IS NOT DESIGNED FOR FREE-STANDING USE TO KEEP IT FROM BEING TIPPED OVER. 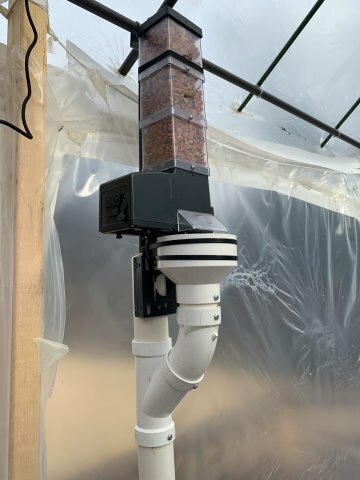 IMPORTANT NOTE: IF PLANNING ON INSTALLING THIS FEEDER OUTDOORS, MAKE SURE YOU ADEQUATELY PROTECT AT LEAST THE CHUTE AREA WHERE THE FOOD COMES OUT (BOXED-IN BEST). IF YOU HAVE RACCOONS, YOU MUST DO THAT. ALSO, BE SURE TO KEEP THE SUPPLIED POWER SUPPLY OUT OF THE WEATHER. Voltage required: Power supply (included) 110-240VAC 50-60Hz 12VDC output--USA style plugs only-not battery operated. We've had the large feeder with the big capacity hopper for 3 years. It has done very well and held up to many many raccoons that are now living at a local state park. 3 years almost to the day the biggest raccoon we've ever seen climbed the feeder and ripped the front off of the chute area so we had to get a replacement (he also now lives at the state park and we have plans for a box around the feeder). I decided on this one for the spare parts. I will continue to buy Superfeeders so long as they're selling them! After watching the instructional video, I was able to adjust the feeder timing and quantity with easy. I have had nothing but great interaction with customer service. 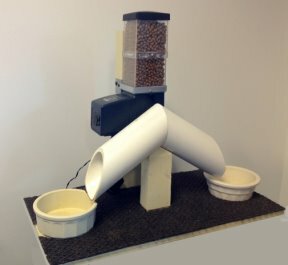 I built a wood box to put the feeder in with a dividing chute so i could feed 2 cats at the same time. 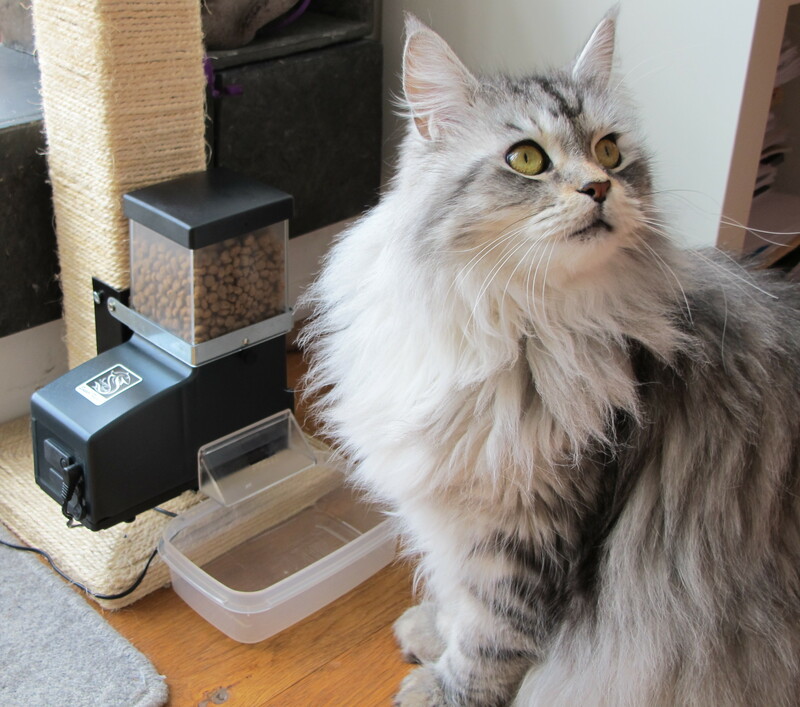 The machine is a little noisy when it is running but that is good to alert the cats that it is feeding time. They got used to it after a few feedings. Great product! Well constructed and easy to use. I think this will last for years to come! I found this feeder excellent. It was simple to assemble, install and set up. Maybe a little pricey but so far worth every penny. Mine is used to provide frequent small feedings for my overweight cat. My cat inhales his food, so every time I've gone away, he's thrown up because my catsitter visits only once a day and gives him all his food then. I didn't trust most sub-$100 feeders because he's very strong and determined, but I also couldn't justify a $500 feeder. The basic Superfeeder seemed like a good compromise. I attached it securely to heavy furniture so he couldn't knock it over, and instead of using a bowl, I just let the kibbles (Blue Buffalo) bounce on the floor so he had hunt and eat them one at a time. I used a cheap analog lamp timer, and I adjusted the feeder to release less than a quarter-cup at a time. The feeder was very dependable, and this was the first time my cat didn't throw up. The only thing I would improve is how the black lid is fastened onto the clear storage bin; I think my cat could have pried it off, so I taped it down. 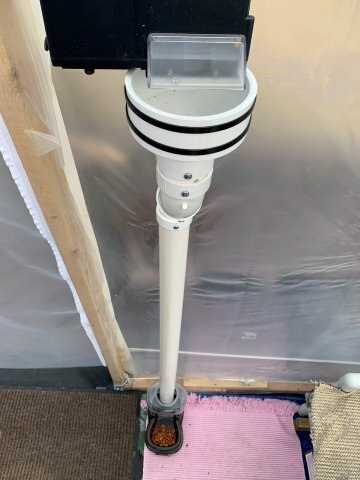 It did take some time and effort to install, but the instruction video was great, and I'm very pleased and relieved that I can keep his feeding schedule closer to normal when I'm gone for several days. 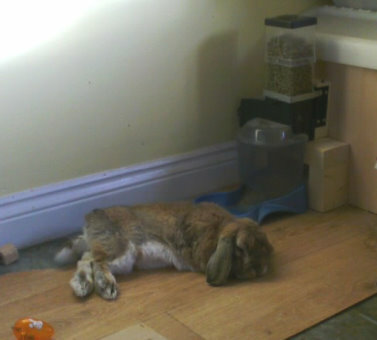 Now I feel OK to leave him alone overnight, and it's definitely saved me lots of anxiety.